Say goodbye to winter with this beautiful dessert, strawberries in the snow. Light angel food cake layered on cream and covered in strawberries. A wonderful dessert to serve at a spring or summer gathering. Springtime is one of my favorite times of year. It always reminds me of new beginnings. We are starting to see signs of spring here in the southeast. The trees and daffodils are starting to bloom and the weather is slowly getting warmer. When I graduated from high school my mom gave me one of my favorite gifts of all time, a binder filled with her favorite recipes. It was for my “new beginning”, living alone at college. These are recipes that she made and recipes that had been passed down through our family. My mom thought I would be able to make them for myself and friends when I was away at school. One of the recipes she included was strawberries in the snow. This is a dessert my grandmother used to make us every Easter. Me and my sister would try to quickly eat our Easter dinner so we could get to the strawberries in the snow. This recipe is very simple but is delicious! Start by buying or making an angel food cake. I use a box mix for my cake. Once it is baked and cooled, cube or tear the cake into 1-inch pieces. 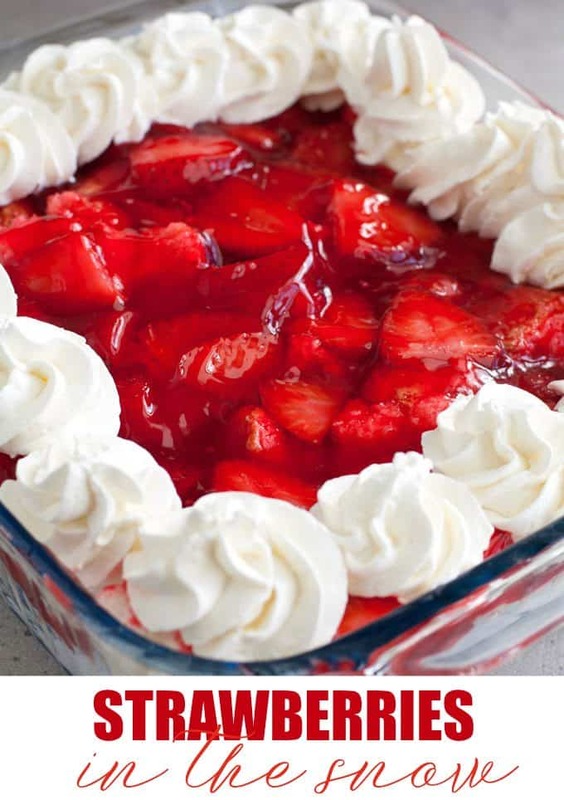 While the cake is baking, slice up fresh strawberries and mix them in a bowl with sugar. Let this mixture sit for at least one hour. Next make the cream layer or the “snow”. Mix together softened cream cheese, frozen whipped topping and powdered sugar until combined and creamy. Spread the cream mixture in a 9×13 casserole dish and add a layer of cake pieces on top. Push some of the cake pieces down in the cream mixture. Combine the strawberry and sugar mixture with a package of strawberry glaze. Spread over the cake mixture and chill in the refrigerator. Strawberries in the snow is a perfect dessert to serve for spring and summer holidays. It can be made the day before and stored in the refrigerator. You can serve it in a casserole dish, trifle bowl, or even make individual servings. Light angel food cake is layered on cream and covered in strawberries. A wonderful dessert to serve at a spring or summer gathering. In a small bowl, stir sliced strawberries and 1/2 cup sugar together. Let sit in the refrigerator for at least one hour. After strawberries have chilled and made some juice, stir in strawberry glaze. In a mixer, beat softened cream cheese, frozen whipped topping and powdered sugar together until creamy. Spread cream mixture in a 9×13 dish. Cut angel food cake into small, 1-inch pieces and place the cake on top of cream mixture. Gently push some of the cake pieces into the cream. Top with strawberry mixture. Chill in the refrigerator. I reserve approximately 1/2 cup of the cream mixture to pipe on top of the dessert for decoration. Can be stored in the refrigerator for up to 3 days. This looks absolutely incredible. Even at 8:51 in the morning. It has fruit in it – and dairy – so acceptable for breakfast, right?! Haha. Presentation is everything for me when choosing my food recipes and i totally love this. Looks so good. I know my hubby would love this so I will definitely be making it. I’ve always thought that there’s nothing better than strawberries and angel food cake. This dessert would be great. 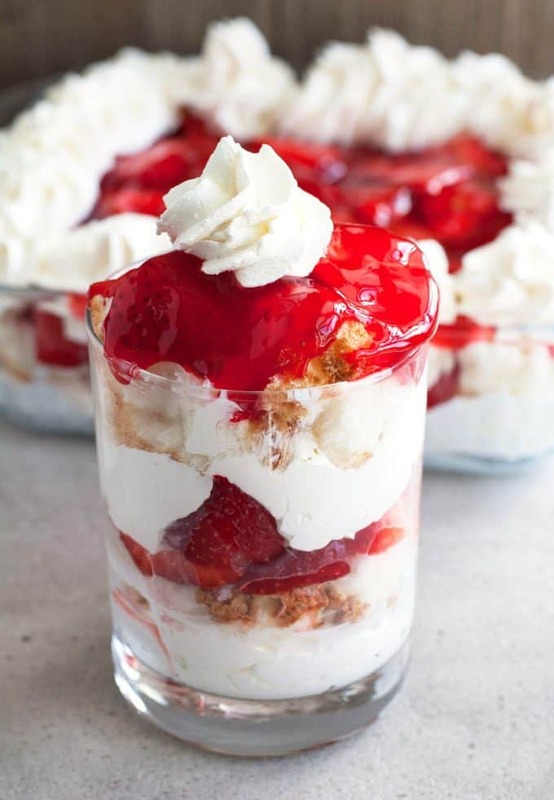 We love strawberrries and cream, so this is going to be a big hit in our house! Thank you! Simple, yes, but it looks yummy. I think the kids would love this. This looks delicious and would be a great idea for a new dessert to try. This reminds me of Spring! fresh strawberries and whipped cream!Yummm! Hello! I’m visiting from the Tutorials & Tips link up party! I absolutely love your post, this looks so delicious and Spring-centric! I love fresh strawberries! Your photos are absolutely beautiful too, your blog is so wonderful! So cute and tasty!! YUM! This looks really yummy! Will have to try it! This looks really good I bet it would be lots of fun to do with a little baker. I love strawberry and cream- this is just my cup of tea! Strawberries In The Snow looks delicious! Hope you are having a fantastic week and thanks so much for sharing with us at Full Plate Thursday! 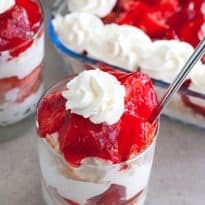 Pingback: 19 Sweet Strawberry Recipes for Spring - Desserts, Drinks and More! 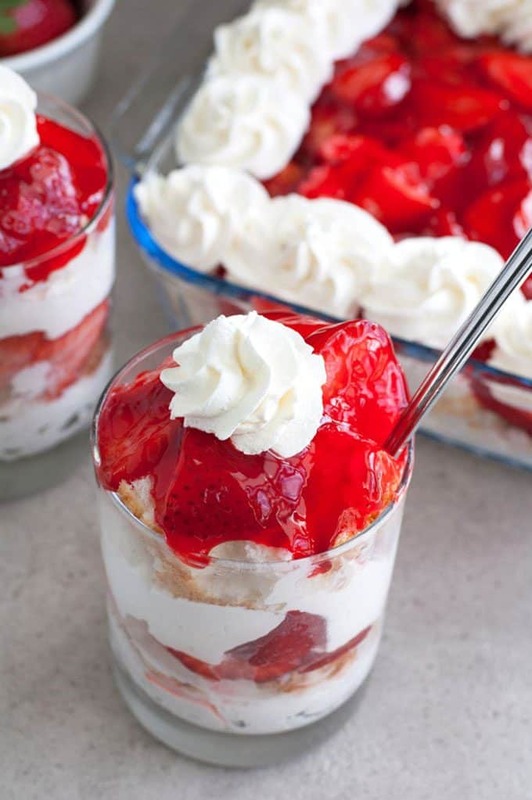 This dessert will make a nice addition to our summer gatherings! I make this but use dark chocolate cake mix and use milk instead of water for cake. I call it strawberries in the dirt everyone loves it. Get a request at every family get together.